Investment in a fixed deposit scheme is often considered safer as compared to investing in other investment options like shares or money markets.Fixed deposit schemes allow people to invest money for a stated period of time post which a fixed rate has to be paid until the end of the deposit period. Union Bank’s fixed deposit scheme offers great returns upon maturity. No penalty is charged for pre-closure of the account. No interest is applicable is account is closed within 7 days of opening. Senior citizens can avail 0.5% higher rates as compared to regular customers. Union Bank FD: Is it the best way to save? Fixed deposit schemes promise of security and steady gains and hence are a preferred investment instrument for many. Banks offer competitive interest rates with a variety of lock-in periods catering to the needs of a wide range of investors. However low risks equal low returns as well. A mix of low risk and high-risk investment instruments is a smart investment strategy and hence mutual funds can be considered as a good investment option for higher returns. In case of mutual funds, your money is managed by professional fund managers who have experience in predicting market trends and make sure your money is invested in the right way. This mitigates the risk that mutual funds come with to a large extent. Hence, from a wealth creation perspective, mutual funds help you achieve your financial goals to a certain extent. The following groups and individuals are eligible to open an FD account with Union Bank. Premature withdrawal/account closing is allowed by Union bank, however, as per bank policy, some penalty might be levied. For a term deposit of below Rs 1 crore, no penalty is charged on premature closure. For deposits exceeding Rs 1 crore a 1% penalty on the interest rate will be applied. Union Bank offers a tax saving fixed deposit scheme called the “Union Tax Saver Deposit” scheme, with a minimum lock-in period of 5 years. Individuals, minors, and HUFs are eligible for this. Minimum deposit is Rs 5000 and in multiples of Rs 1000 thereafter. The maximum limit is Rs. 1,50,000. The deposit is accepted in the form of DRIC or fixed deposit or Monthly income scheme and the maximum period of deposit is 10 years.You can go for this fixed deposit scheme to avail tax benefits under section 80C of the Income Tax Act,1961. However it is important to note here that in case of fixed deposits, the tax levied is dependent on the tax bracket you fall into, irrespective of FD tenure. If the interest earned on your fixed deposit is more than Rs 10,000, TDS deduction of 10% would be deducted by the bank. TDS certificate will be provided by the bank upon deduction. Mutual funds have an edge over fixed deposit in this regards as tax payable on mutual funds depends on the category. For example, returns on equity funds like Equity Linked Savings Scheme (ELSS) are tax-free and up to 1.5 lakh can be claimed under section 80C of the Income Tax Act, 1961. Also, long-term capital gains on equity mutual fund units held for more than 12 months are tax exempt. They offer a higher capital appreciation potential and a smaller lock-in period of 3 years. Hence we can say as compared to fixed deposits, investing in Mutual funds is better in terms of tax saving. 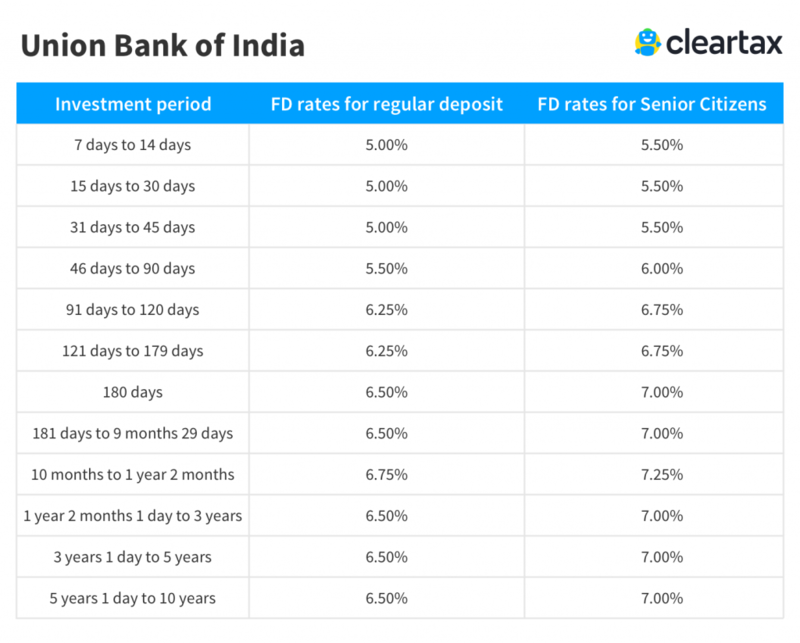 Fixed/Short Term Deposit– A standard FD scheme offered by Union Bank of India wherein customers are paid fixed interest amounts at regular intervals. Quarterly/Monthly Term Deposit– In this scheme, customers can choose to receive interest payments at monthly or quarterly intervals.